Why Am I Throwing Up in the Middle of the Night? Do you wake up vomiting in the middle of the night? Are you losing sleep because your rest is interrupted by bouts of nighttime vomiting? There could be several reasons you’re experiencing this problem and often, they are the same issues that cause people to throw up during the day. One of the most common reasons people wake up vomiting in the middle of the night is stress. Many people don’t admit to feeling stressed or anxious when they are awake. They are too busy to think about such things. Your body, however, is reacting to the tension. Once you are sleeping and your mind is at rest, your natural instincts take over and vomiting may be its way of telling you it needs some relief from anxiety and pressure. Even though you may not feel heartburn right away after eating, it can creep up on you during the night and cause vomiting. This often occurs after eating greasy, spicy, or fried foods. Caffeinated beverages like coffee, sodas, and tea may also irritate acid reflux, a condition that occurs when acid from your stomach moves up into your esophagus. Alcoholic beverages, chocolate, and acidic foods like tomatoes or citrus fruits are often guilty of causing acid reflux as well. Those who suffer from acid reflux often find relief with over the counter medications such as Nexium or Prilosec. Other tips for dealing with acid reflux include avoiding foods that irritate the issue, not lying down for at least three hours after eating, sleeping on your left side, and sleeping with your upper body elevated by pillows or raising the head of your bed. Contradictory to its name, morning sickness doesn’t only occur in the morning. 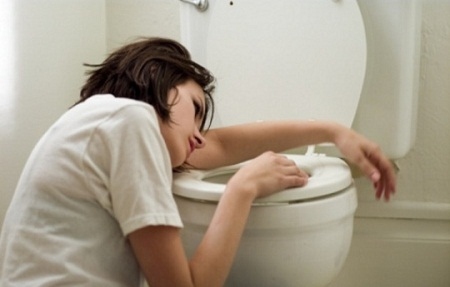 A symptom of early pregnancy, morning sickness can occur at any time, day or night. In fact, it may strike hardest at night when a woman’s stomach is empty. There really is no way to tell exactly why you are throwing up at night unless you visit a doctor and have an examination. Your rest is important and throwing up in the middle of the night is detrimental to your health for more than one reason. Frequent vomiting and acid reflux can cause long term damage to the esophagus and other parts of the body. Don’t wait until the damage is done. See your doctor right away and get proper treatment.